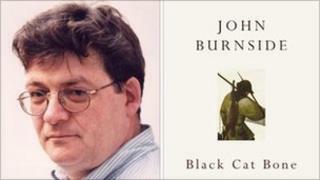 John Burnside has been named the winner of the £15,000 TS Eliot Prize for Poetry for his collection Black Cat Bone. This year's prize has proved controversial, with two poets withdrawing because of its sponsorship by an investment company. Burnside, 56, who chose to read a poem instead of make a speech, told the BBC he was "stunned" to have been chosen. He said he had never considered withdrawing over the sponsorship issue. It is Burnside's second prestigious poetry prize in under six months. The Scottish writer won the £10,000 Forward Prize for the same collection in October. Burnside was announced as the TS Eliot prize winner at a ceremony at the Haberdashers' Hall, in London, on Monday. "I really was surprised, I was actually stunned that they chose me," said Burnside. "I thought I could relax and enjoy the evening as I've had my piece of the pie, so when they said my name I thought there had been a mistake." Black Cat Bone, the judges said, was "a haunting book of great beauty, powered by love, childhood memory, human longing and loneliness". The other shortlisted poets were: poet laureate Carol Ann Duffy, Leontia Flynn, David Harsent, Esther Morgan, Daljit Nagra, Sean O'Brien and Bernard O'Donoghue. I think they made those decisions for their own strong moral reasons. Poets John Kinsella and Alice Oswald withdrew from the shortlist in December in protest at the sponsorship of the prize by private investment management firm, Aurum. Kinsella said at the time that the business of Aurum did "not sit with my personal politics and ethics". Oswald, who won the TS Eliot prize in 2002, said she felt "uncomfortable" about Aurum's sponsorship and that poetry should be "questioning, not endorsing" such institutions. Burnside said: "I totally respect their decisions, I think they made those decisions for their own strong moral reasons. "It wasn't a decision that I even considered... I'm always glad when a business or an individual who has money, whatever form it comes in, wants to support the arts." He said that not wanting to take part would be "a bit like Michelangelo saying to the Pope 'I don't want your money' - so he won't be able to make his art any more". The writer added: "I did a little bit of research about the company. I didn't see anything extraordinary that made me feel worried. "I am glad always when people want to support the arts, especially an art like poetry which doesn't get a huge amount of support. "I'm sure Eliot wouldn't have felt he wanted to withdraw from a situation where an organisation which made money in a legitimate way supported the arts." Black Cat Bone is Burnside's 11th book of poetry. The book's title refers to a particular bone extracted from a live cat, which is referred to in blues music as a good luck talisman. Gillian Clarke, chairwoman of the judges, said: "In an exceptional year, it is an outstanding book, one which the judges felt grew with every reading." Sion Hamilton, manager of Foyles bookshop, said: "His profound appreciation for the stylistic possibilities of language is married to haunting and almost dream-like imagery, resulting in an elegant collection of poems that greatly reward re-reading." Burnside won the Whitbread Poetry Award in 2000 for The Asylum Dance, which was also shortlisted for the Forward and TS Eliot prizes. Born in Scotland, he moved away in 1965, returning to settle there in 1995. In the intervening period he worked as a factory hand, a labourer, a gardener and, for 10 years, as a computer systems designer. He is a former writer-in-residence at Dundee University and now teaches at the University of St Andrews. The prize money - £15,000 for the winner and £1,000 for each of those shortlisted - is donated by TS Eliot's widow, Valerie, and the late poet's estate. Aurum's sponsorship money goes towards management costs. Prize organisers, The Poetry Book Society (PBS), secured the three-year sponsorship deal after losing its funding from the Arts Council. Previous winners of the prize include Ted Hughes, Carol Ann Duffy and Seamus Heaney. Last year the prize went to Derek Walcott.